Has the Time Come to Test Experimental Ebola Vaccines? Mortality rates are currently at 60%, where normally up to 90% of affected people die. Unfortunately, there are no cures or vaccines for the disease, despite its emergence in 1976. David Heymann, a professor of infectious disease epidemiology at the London School of Hygiene and Tropical Medicine (LSHTM) who was on site in for the first Ebola outbreak in Zaire, DRC in 1976, has said that ‘this is clearly an outbreak across international borders and it has not been handled properly.’ Heymann says ‘it’s not rocket science to control these outbreaks but instead basic epidemiology: infection control, hygiene practices, contact-tracing and safe burial practices.’ Since the virus in transmitted through contact with infected bodily fluids, the virus is highly contagious and hygiene when dealing with patients is of the utmost importance. There are no licensed drugs or vaccines for use against Ebola as its periodic and usually small-scale nature means there has not been a big enough market nor the opportunity to conduct large-scale trials in humans exposed to the disease. The biology of the virus also makes it difficult to develop vaccines that create an adequate immune response as there are multiple strains of the virus, meaning an immune response is needed against all of them. To complicate matters, Ebola’s ability to replicate rapidly could mean the virus may rapidly evolve resistance against a vaccine. Peter Piot, Director of the LSHTM, warns that caution must be exercised if the safety of experimental drugs is to be assessed during an outbreak, then is must respect ethical standards, as there is a growing mistrust towards healthcare professionals amongs communities affected by the virus. Here, Piot refers to resentment towards healthcare professionals who enter these communities in fully protective suits and tell them to change their cultural practices, particularly their burial traditions (which involve cleaning the body), in order to prevent spread of the disease. As a result, healthcare officials are often threatened with weapons. Indeed, there is a fine balance that must be struck between safe disease prevention practices and understanding and respecting local traditions. It is too late in this outbreak for vaccines to have enough of a preventative impact, but Ebola will emerge again in the future. If safety can be proven, vaccines could improve help prevent future outbreaks. 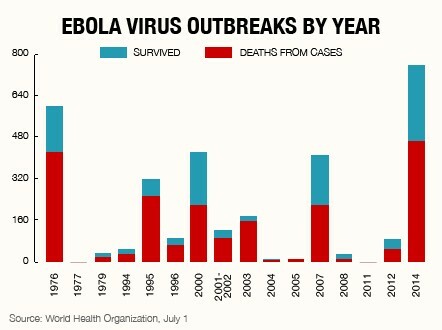 Read more about it here: Ebola outbreak: Is it time to test experimental vaccines? Just as Leicester did in the UK during the Smallpox outbreak resulting in the lowest mortality despite the lowest vaccination rate! The under trial vaccines if safe seem promising to support in the context of, God forbid, future outbreaks. The societal situations of present day Africa and UK do not match to expect similar implementation of basic epidemiological control measures. Fairly prophetic – although it wasn’t vaccines that were first used, but a therapeutic agent. And made in plants, at that!